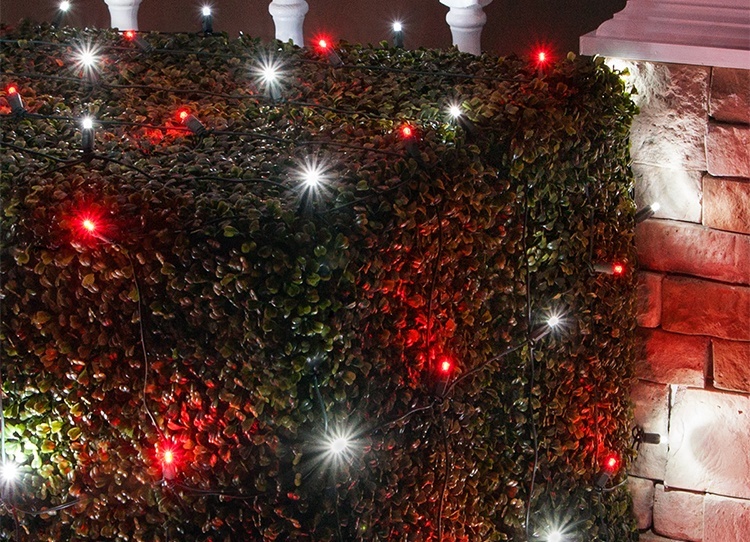 Wrapping bushes with lights has been a popular outdoor Christmas decorating idea for many years. Originally the only way to achieve lighting on bushes was through the use of string lights either wrapped around or tucked into the interior of the shrub, until one day a very smart elf came up with an easier solution and net lights were born! 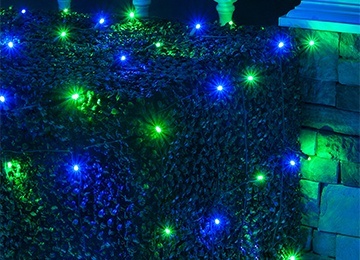 Net lights are string lights that have been connected to form a grid, which can easily cover the exterior of bushes or tree trunks in a fast, hassle free installation process. Net light installation is very easy once you know where to start and the best method for creating the look you want to achieve. 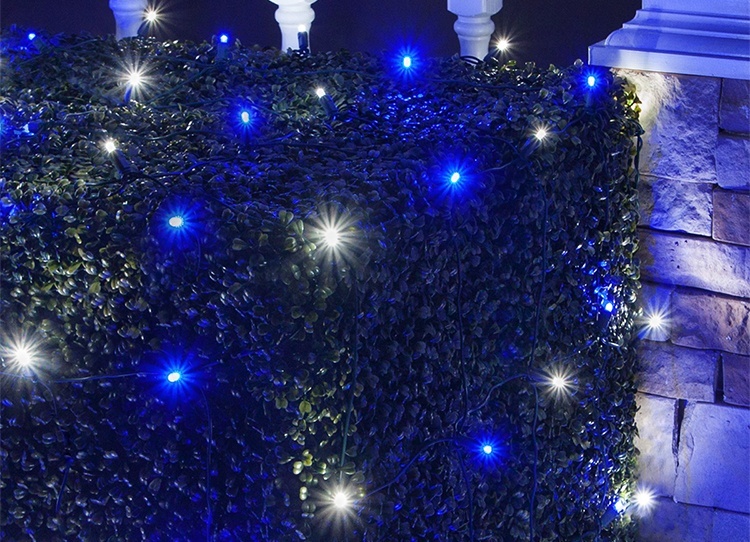 Net lights can provide a unique look of patterned lighting across a large number of bushes, however if you prefer random lighting patterns, this can be accomplished with net lights too! 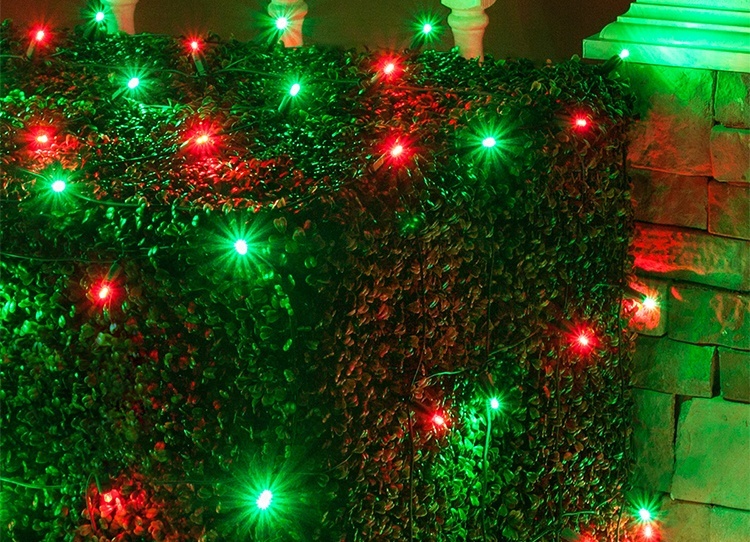 Square Bushes - Start wrapping with the edge of your net light at the corner of your bushes as you would a present. This will create a smooth edge and even light distribution. Conical Bushes & Shrubs - Turn net lights vertical and hang in panels around the bush. This method will help to avoid a heavy concentration of lights at the top. Holly Bushes - Care should be taken when placing net lights on sharp leafy bushes. Wear gloves and try to prevent the wires from getting snagged or damaged. 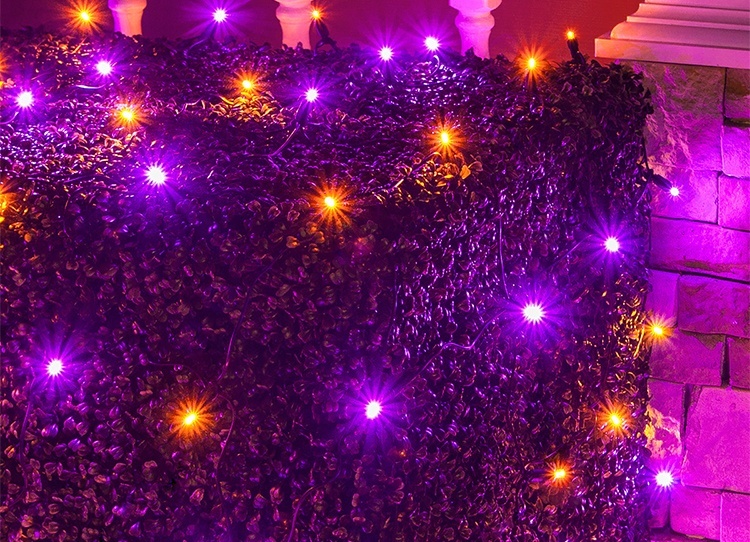 Creating Bush Lights with a Pattern - It might help to first lay the net lights side by side on the ground in front of your bushes in the way that you plan to place them. To create a uniform grid you will want to make sure that all of the vertical and horizontal strings are lined up across each net light. Take care to keep net lights facing the same direction when wrapping them around your bushes and avoid overlap as much as possible to prevent a heavy concentration of lights in some areas. To Create Random Light Patterns - If you want your lights to appear random instead of patterned, there are several ways to achieve this look. Try overlapping the nets across your bushes and adding in a few strands of string lights over top. You can also push the nets further into your bushes instead of laying them over top. 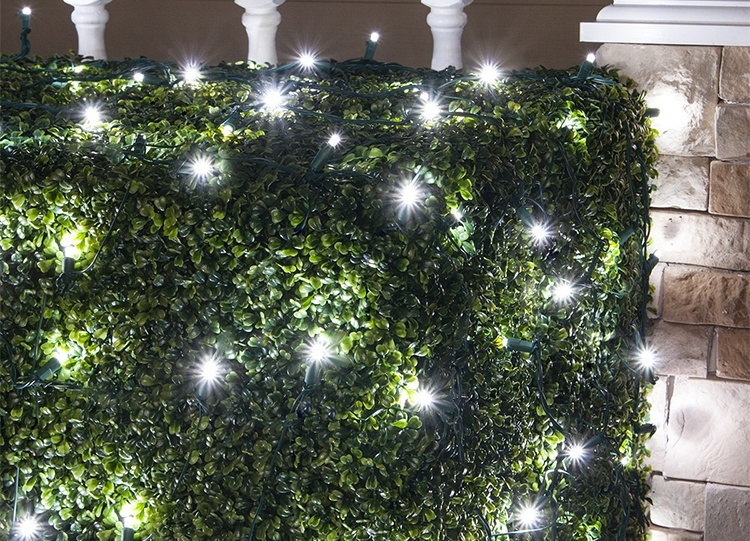 The greenery above the net will diffuse the light slightly, creating an inviting glow from within the bush, which also helps create a more random light pattern. Incandescent and LED net lights have end-to-end connectors, making them easy to plug in to one another as you go. Depending on the type, you can usually plug 14 to 21 LED net lights in together on one outlet, whereas the max number of incandescent net light sets that can be connected is typically 3. 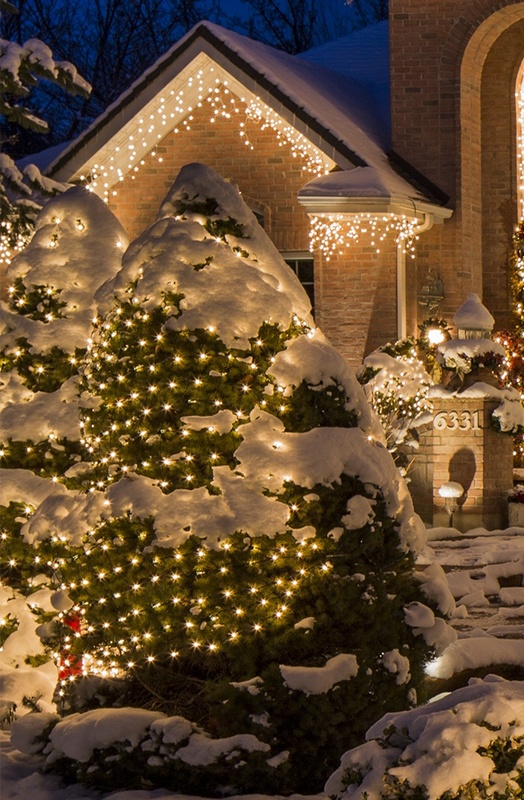 If you will be plugging multiple sets into each other it is best to check the specifications on the net lights you are interested in and plan accordingly. After you have installed your net lights based on the suggestions above, plug your lights into an outlet and step back to check that the light pattern is as you want it. Make adjustments as necessary. Thanks to the ease of installation, many decorators turn to net lights for creating light wrapped trees and columns as well as bushes. There are even different dimensions of net lights - often referred to as trunk wrap lights or column wraps - available to wrap a variety of tree trunk and column sizes. Refer to the quick references below on which net light or wrap is best for creating trunk lights based on the size of your tree. Tip: To determine the circumference of your tree trunk, wrap a string around the trunk at its widest section and cut the string at the point where the two ends meet. Then lay the piece of string flat and measure it with a measuring tape, this will give you the circumference of your tree trunk! Typical trunk light wraps measure 2' x 6' and 2' x 8' and are the perfect size for wrapping small trees. If your trees are just a little over 2' around, adjust your trunk wrap so that the gap between each edge is at the back facing side of the tree and secure each side with a zip tie or wire that matches the wire color of your lights. 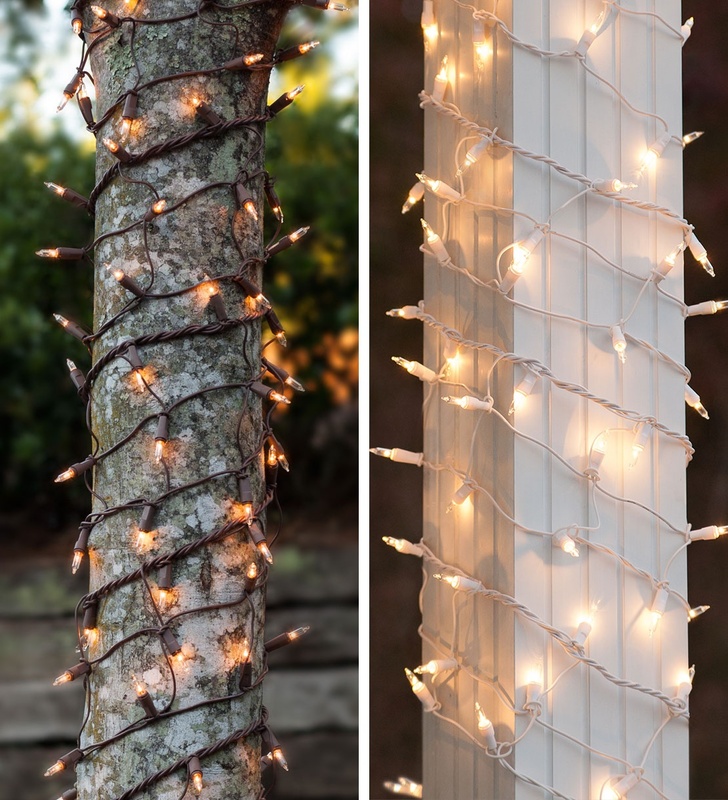 Net lights typically measure 4' x 6' and can be used as tree trunk lights for trunks measuring larger than 2' wide. If you want your light wrapped trees to be even brighter or seen from from a distance, net lights can be wrapped multiple times around smaller tree trunks as well. Densely wrapping tree trunks is a common technique used by professional decorators with either string lights or multiple net lights. Typically measuring 6" x 12' or 6" x 15', column wraps can be used to quickly and uniformly light both round and square columns. As a result of their long and thin design, column wraps are also sometimes referred to as ribbon wraps and can be swirled around conical and round bushes in the same way you might wrap a ribbon around a Christmas tree.